Sober Look: Why has the US broad money supply flat-lined in 2013? 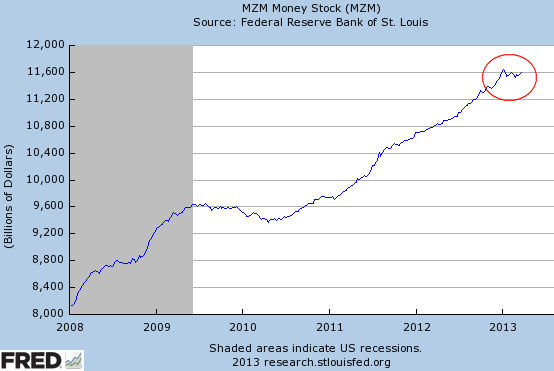 Why has the US broad money supply flat-lined in 2013? 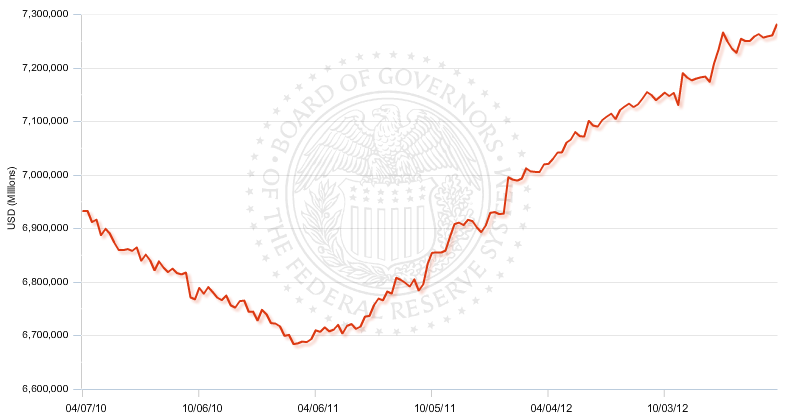 The US money indicators have been showing something odd in the last few months. While the monetary base (M0) has been rising sharply due to increasing bank reserves (the liability side of the Fed's balance sheet), the broader money supply has stalled. Both M2 and MZM measures of money stock have been relatively flat this year. Some attribute this to limited bank lending driving the so-called velocity of money lower, "trapping" liquidity from entering the broader economy. 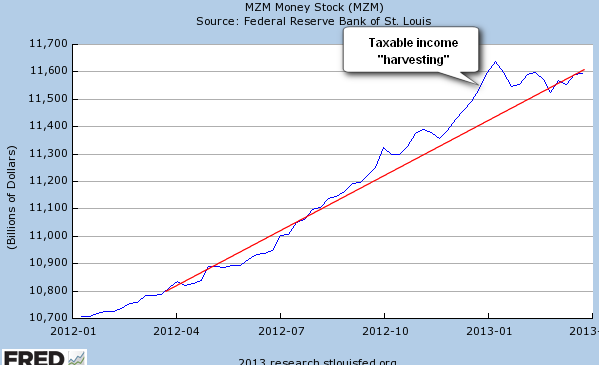 That would explain the growing monetary base and stagnant M2 and MZM. But stalled credit growth can not be the explanation - simply because bank lending in the US continues to increase at a fairly constant pace since mid 2011. The answer has to do with cash balances, particularly in money market funds. The amount of cash in dollar money market funds has declined sharply since the beginning of the year. The retail accounts show a particularly large relative drop. In preparation for higher federal taxes, both individuals and institutions took capital gains, received special dividends, and pushed incomes into 2012 where possible (see discussion). And these accounts have been deploying this cash from the beginning of the year - with a big chunk of it apparently going to equities. That should explain part of the equities rally we've had this year. In fact a closer look at the broad money supply trend shows that the growth has been fairly linear except for the late 2012 jump which has dissipated this year. That's why the broad money supply looks flat from the beginning of the year. Here is another example of "unintended consequences" of government policy and policy uncertainty. Now that the excess liquidity has essentially been used up, what does it say about the stock market rally going forward?